As a poet Marvin Bell always makes do with what is as hand, precisely where he is. Staring at a cracked flowerpot, a leaf underfoot, a jolting headline or ragged night-thought, he will sniff the trail and feel his way into the thicket of language, those leaves that scissor experience, sometimes deliberately or cautiously, a step at a time, sometimes inadvertently or in a headlong plunge. Then once well in, we look around and see that his poems can reflect a lostness, a loneliness that seems to be a precondition for coming upon surprises, making new beginnings. There we often find a disjuncture between what we know and how we feel, a disparity between what we sense of our situation, and what we can’t do about it. Sometimes this situation is entirely his own, but with the skill and luck of a lifetime often what he depicts suddenly opens up enough that you can see for miles, and we might as well call this vista the human condition. And here he has you well and truly caught, laughing and grieving for all of us. Starting with my first word. I believe him, and in the rare entrances and prospects he offers. 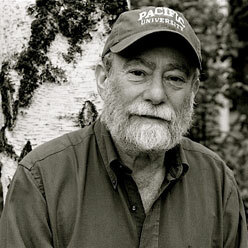 Marvin Bell is the first Poet Laureate of Iowa, the Flannery O’Connor Professor of Letters at the University of Iowa, a long-time member of the faculty of the Iowa Writers’ Workshop, and the author of 14 books of poetry. He has won the Lamont Award, a nomination for the National Book Award, an American Academy of Arts and Letters Award, fellowships from the Guggenheim Foundation and the National Endowment for the Arts, and Senior Fulbright Fellowships to Yugoslavia and Australia. "Dew at the Edge of a Leaf"
Broadside created by Paul Hunter/Wood Works Press for the poet�s reading for Counterbalance Poetry on Wednesday, October 18, 2000. Printed from hand-set metal type on archival paper with original woodcut. Limited to 160 copies. Broadside created by Paul Hunter/Wood Works Press for the poet�s reading for Counterbalance Poetry on Thursday, September 20, 2007. Printed from hand-set metal type on archival paper with original woodcut. Limited to 185 copies.